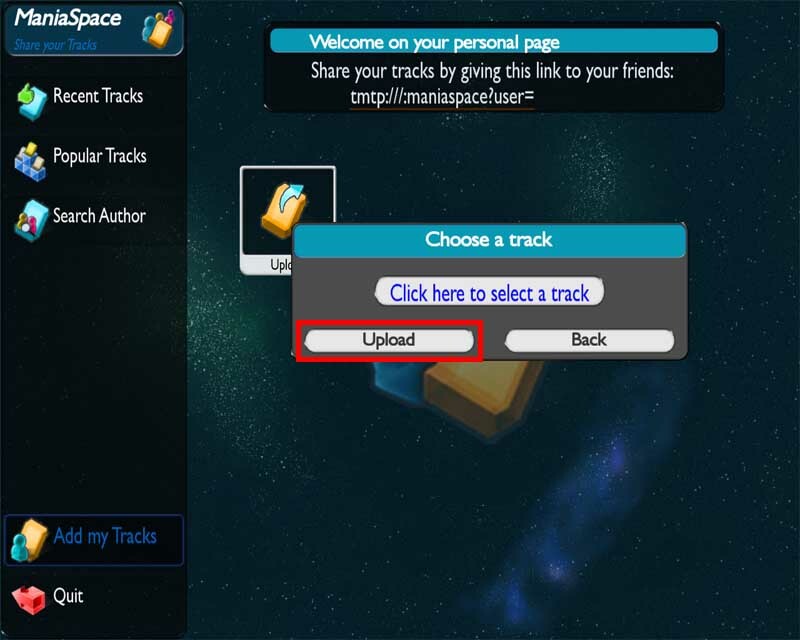 Maniaspace is a manialink developed for the community to help trackbuilders who want to share their creations on a manialink, but who don't want/or don't know how to make one. Q:Who can access to this manialink? Everyone who has bought Trackmania United, and has installed the Forever patch. Q:How to Access to Maniaspace? There is 3 ways to access to Maniaspace. - The first way is made for people who want to surf on Maniaspace, download the most recent tracks, the most downloaded tracks, or find an author. For those people they just have to type [url=tmtp:///:maniaspace]maniaspace[/url]. 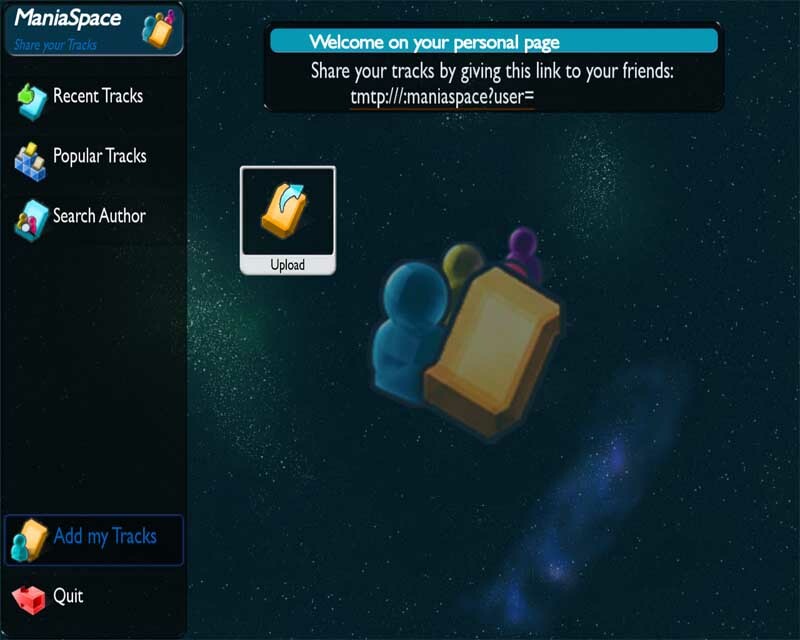 You can also type "maniaspace" in the ingame manialink browser. - Thirdly, by clicking on a link shared by a member on maniaspace. Q:Can I have some coppers with Maniaspace? 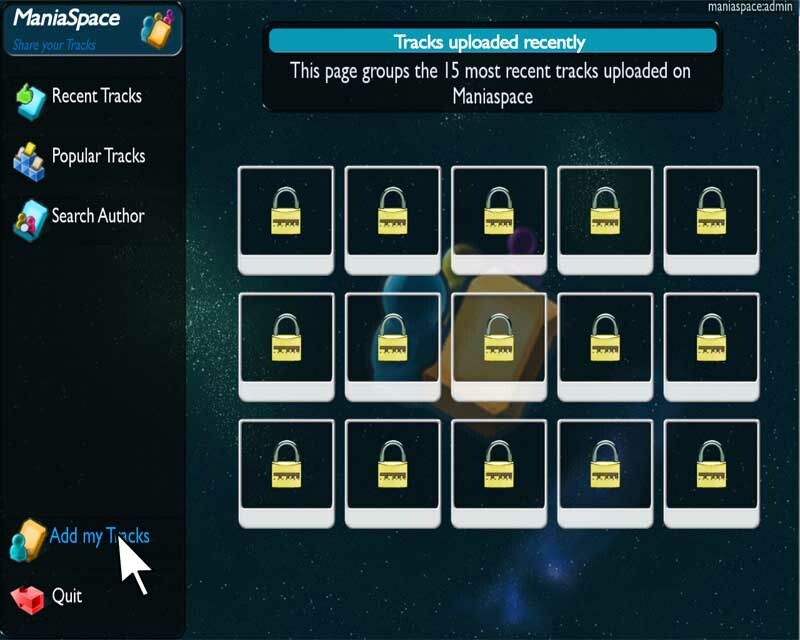 Yes, you can get coppers by registering your tracks on Maniaspace and by uploading your replays. Each track downloaded will give you 9 coppers. Each replay downloaded will give you 4 coppers. Q:Can I change the cost of my tracks or the repartition? No, this is not possible, the costs are fixed. Q:How to become a member of Maniaspace? Q: How to upload a track? The upload of a track costs 20 coppers, it can sound like a little expensive at first, but if 3 players download your tracks you will win 27 coppers. To upload a track, click on the "upload" button. Caution: You should be the author of the selected tracks, if the author name of your tracks is different from yours, the upload will failed. Finally click on Upload and pay 20 coppers. Q:How to Upload a replay on Maniaspace? 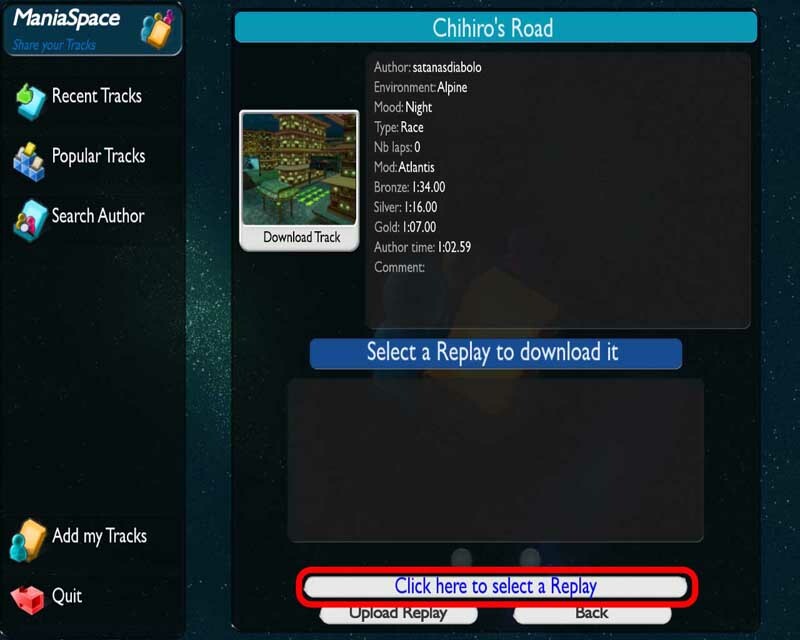 First select a track in maniaspace (of course you have to register a replay of the selected track), then click on the button squared on the screen above, and select your replay. Then click on "upload", this last action is billed 10 coppers. Q:How many replays can I upload? You can upload all the replays you want. If the last replay uploaded is not better than the previous one, this won't be registered. If there are 10 replays on a track, you can't upload a new replay except if you've made a better score than a player in the board. It would be better if this system would work with TMX together, but I like this Manialink. 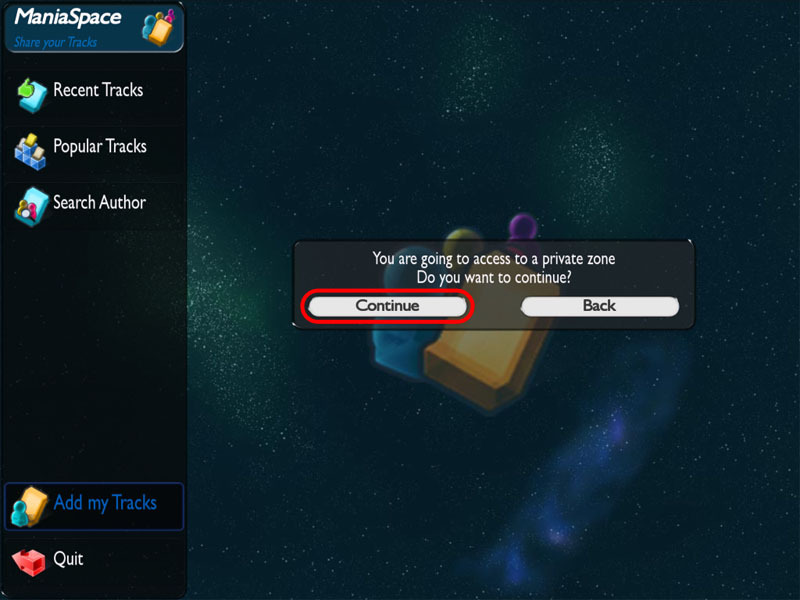 Will we be able to add a track from ManiaSpace directly to a server?